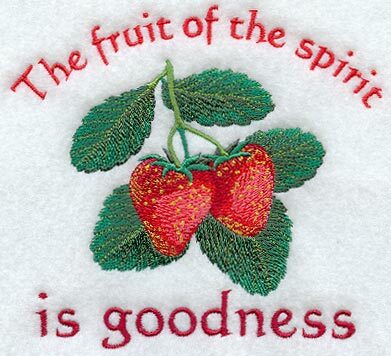 This entry was posted in Encouragement and tagged fruit of the Spirit, Galatians 5, godliness, Goodness, Holy Spirit, humanity, loving others, sinful creatures, Sony Elise, total depravity, walk in the Spirit. Bookmark the permalink. Precision in our communications is imperative. Being good or practicing good according to who? According to Jesus, according to Psalm 53 no such person except Jesus has ever lived. The typical person defines good according to mans standards. This is a false and dangerous concept. While your first paragraph is very praiseworthy and virtually faultless, it is I believe unintentionally somewhat muddied by your second paragraph. God and mankind define good very differently. The English language does a great disservice by limiting our options when expressing such concepts. When God works through us when we are acting out of supreme love for God then and only then, in Gods eyes, can it be acknowledged as being good. According to the word of God! I thought this post was clear in balancing our responsibility to walk in the goodness that comes from Christ while acknowledging that such walking (doing good) in itself is only possible through Christ. This reminds me of a story Paul Washer tells where he is out with a group of calvinists at lunch. The recently converted waiter gets excited when he sees they have Bibles and tells them how he ‘found Jesus and got saved’. Paul Washer looks at their faces and says ‘I know what you are thinking – he didn’t say it right – but better to have it and not explain it perfectly then to be able to explain it perfectly and not have it’ *paraphrase. I am also reminded of Jonathon Edwards who didn’t fear of speaking on mans works reflecting his faith but rather feared for professing calvinists who exalted themselves to the heavens in their knowledge of their doctrines, of whom he considered to be religious hypocrites. I hope I have been precise in my communications with you.